Former midwife OFW-turned-housewife-and-family business associate, Sophie Aguilar-Borja has been the subject of a lot of help by many artist netizens on Facebook who have joined the group created for her by her entrepreneur husband William Borja and his artist best friend Franklin Valencia. The group called A Bucket of Love for Sophie aims to seek for medical aid as the family cannot sustain all of it and they want her to have the best care that they can seek for her. She is suffering from ALS-Amyotrophic Lateral Sclerosis, the same disease of English physicist Stephen Hawking who made the news two years ago because of it. Sophie’s calvary started when her right hand could not lift a spoon. Then, her left hand was unable to turn on the switch. From that day on, life has become dark for her. She often stumbled because she lost her balance. Then, her lungs needed assistance to breathe and her mouth could no longer savor the taste of food as she has now resorted to tube feeding because she cannot chew and swallow anymore. In his creating the Facebook group, artist Franklin Valencia appeals to all his artist friends to help raise funds for Sophie’s medical needs. “By donating your paintings, you can help ease the financial burden incurred and help educate people about ALS,” he wrote. Who is Sophie and why does she deserve a bucket of love? SOPHIA AGUILAR-BORJA, 52 years old, of Pureza, Sta. Mesa, Manila is my loving wife and caring mother to our two children. She used to work in the medical field. Sophie was a midwife when we lived in Saudi. But when we decided to return to the Philippines, she became full-time and my better half with Wilborj Acryclic Plastic Fabrication. We specialized doing LED signs as our small family business. She worked until she got sick and was forced to stay home because of ALS Disease. This photo was taken during New Years to greet everyone Happy New Year and to thank all the artists for their help. When did she get sick and diagnosed with ALS? She was diagnosed in 2011. 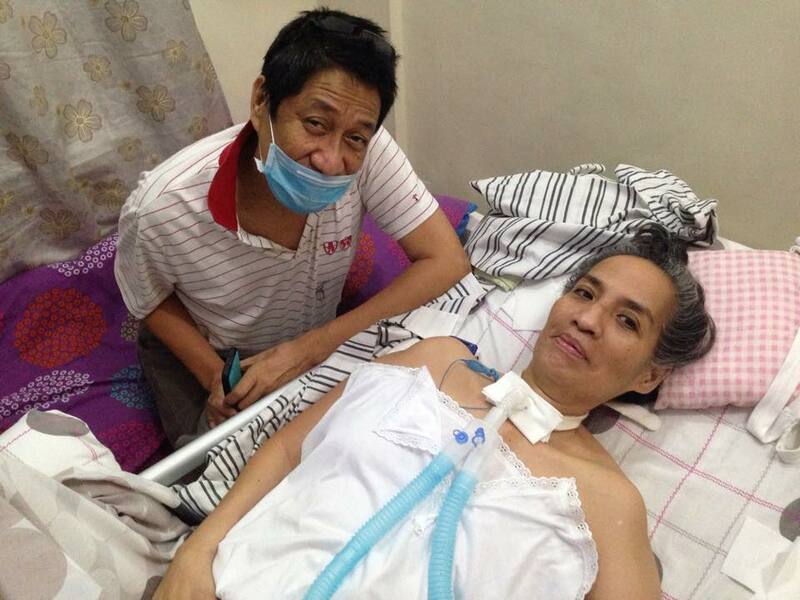 Na-confirm kung ano ang sakit niya, MOTOR NEURON DISEASE. We have a little business called Acrylic Fabrication, but her medical needs are so high that we cannot afford to sustain the business. We are renting a ventilator machine for her breathing needs. She is now totally bedridden. She cannot even lift her finger. Mayroon na siyang nakakabit na small hose connected directly to her stomach. ‘Yong mga extremities niya is like chicken legs na. Almost all her muscles shrank. Mukha na siyang polio victim na halos ‘di ko na makayang tignan. ‘Yong income namin sa business ay tama lang sana sa normal na pamilya, pero noong huling na-ospital siya, ‘yong kaunting savings namin ay naubos na lahat at napakalaki pa ng kakulangan. With new friends who filled Sophie’s buckets. Artist and buyers helping each other. Hanggang ngayon, sobrang laki pa rin ng aming pangangailangan. Hindi ko siya puwedeng panoorin lang na mag- deteriorate. Whose idea was it to create a Facebook group for her? How long has it been existing? How many members do you have now? It was my idea na mag-publish sa Facebook ng isang donation campaign one month and a half months ago. There are 232 members as of now. My close artist friend since 1972, Franklin Valencia, who helped me make it happen. A Bucket of Love for Sophie Facebook page creator was the one who solicited help from artists who donated their paintings to help raise funds for Sophie’s clinical needs. What has the group done for Sophie so far, from when it began (past achievements, ongoing projects/ activities, future goals)? Because of this campaign, nairaos namin ang month of December. Lahat ng gastos sa medical needs ay galing sa donasyon ng mga artist, painting collector, at cash donor na patuloy pa ring sumosuporta kay Sophie. What was the biggest amount of help that the group has raised for Sophie? Through which painting and by which artist? Ang may pinakamalaking naidoneyt na painting ay ang mag-asawang (The biggest donation of a painting was by couple) PHILIPP at THELMA BADON. Ang may pinakamaraming nabiling painting ay si (The bestsellers were) Ms. SONIA WHITE of London, sunod ay ang mag-inang (next is the mother and daughter team of) Ms. NING ODULLO at (and) Ms. Cecil Penaflor. 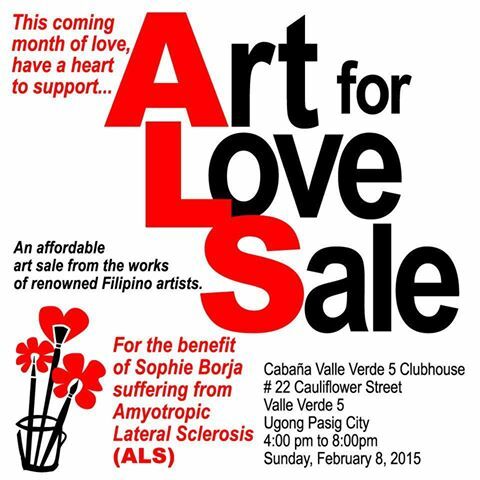 Aside from auctioning paintings for the benefit of Sophie? Are there other ways that the group does to help her? How? Are you also funding or donating to research for the cure of ALS? Madaling humingi ng painting at madali rin magbigay ang artist. Madali rin bumili ang mga kolektor dahil ito ay mura at nakatulong pa silang lahat. Magaan sa loob nila ang magbigay at tumulong. How is Sophie now? What did her doctors say about her condition? Now she is totally bedridden. Mayroon siyang ventilator machine na nirerentahan namin ng Php 2,500 a day. Plus, ‘yong kanyang mga gamot at mga gamit pang-medikal. Umabot kami ng Php 230K ang gastos dahil hindi siya pwedeng alagaan ng hindi nurse dahil from time to time, sinasaksyon siya every two hours at nurse lang ang puwedeng gumawa noon. Isa ‘yon sa pinakamabigat na gastos namin dahil ang bayad sa nars ay Php 1,800 / 12 hours at 1,400 sa midwife per 12 hours. (It has been very expensive for us. Sophie needs a nurse 24 hours a day and we need to find an NGO who can help us care for her with all the specifications to her needs). Our youngest daughter Jean Kathleen is a nurse. She looks after her mom but she cannot do it 24 hours. An affordable art sale from the works of renowned Filipino artists. Everybody welcome! What does the future hold for A BUCKET OF LOVE FOR SOPHIE? I am hopeful this 2015 that Wilborj Acrylic Plastic Fabrication, my small family business will have more projects this year. I let my eldest son Eugene Lawrence who graduated with a degree in advertising manage it now. Sana matulungan ninyo kaming maiparating sa mga may magaganda at mabuting kalooban ang pangangailangang medikal ni Sophie. Kailangan po naming makabili ng ventilator machine niya. All images courtesy of Mr. William Borja unless noted otherwise.. Image credit feature image painting (yellow)- Mel Dominguez. Filipino art online communities provide a wide range of opportunities for supporting a cause, marketing the creative, or building an open source of realization that Filipino artist can also succeed in the hard to crack world of art. These Filipino art communities help others see that they are as good as their Western counterparts. Kim Marcelo’s advocacy, Kimnetix and AFKN’s founder – Wine Merchant, PR and Marketing Consultant, and Event Organizer–aims to help our own as much as he can. Kimnetix Networx is an online magazine type Facebook page where it gives Filipino artists a chance to get featured and showcase their works – whether in the field of visual arts, literature, music, dance, theater, film, and/or architecture. Thus, Artist Friends of Kimnetix Networx (AFKN) was born. AFKN is a virtual online art group which aims to be friends with every Filipino artist and give each one a larger audience. It is not an official art group as it is generally a lifestyle page according to Kim. Kimnetix Networx also features the best dining destinations in the country and what these establishments have to offer. Events that audiences will be interested in, gadgets and even including fashion. In 2014, it was able to do three events for the arts and one for culinary. Kimnetix Networx is the 2nd art group I joined and many of my current artist features came from this page and from AFKN as well. 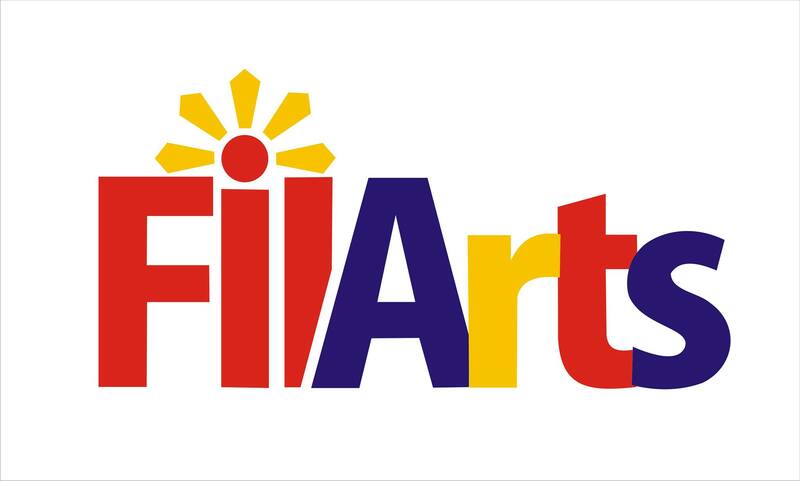 I love this group and am sure you will enjoy seeing all the wonderful artworks by Filipino artists. Learn more about him and his advocacy’s with Jenny’s Serendipity’s set of interview questions. Enjoy! Filipino Artist, Erwin Mallari and Kim Marcelo. Image via Facebook. What is the difference between Kimnetix (Networx) and AFKN (Artist Friends of Kimnetix Networx)? Are they the same or separate pages? Kimnetix Networx is an online magazine type Facebook page, or what used to be called Fan Page, where we feature Filipino artists and their works – whether in the field of visual arts, literature, music, dance, theatre or architecture. We also feature the best dining destinations in the country and what these establishments have to offer. Events that we think our audiences will be interested in. As well as gadgets and fashion from time to time. Artist Friends of Kimnetix Networx is a “Group Page” put up in July of 2014 where members are mostly artists (Visual, Dance, Music, Theatre and Poetry). Kimnetix Networx and AFKN are two separate pages. First, let’s define the difference between PAGES and GROUPS on Facebook in a simple way – in a Page, you invite people to “like” it and usually used for featuring stuffs while in a GROUP, you add or invite people as members. Kimnetix Networx is where we feature the above mentioned and AFKN is where we get our ART related features. Filipino Artist, Wanda Totanes (Child Prodigy Painter). Image via Facebook. Filipino Artist, Lito Brion Ballaran. Image via Facebook. It was your idea to create the FB group? How was it conceived in 2012? Yes, I created the AFKN group since I got tired of getting our features for Kimnetix Networx to different art groups I belong to, on Facebook. I created Kimnetix Networx in the 3rd week of November 2012, can’t remember the exact date though. I initially made it just to feature the things I am passionate about like art, wine, food, collectible toys, films etc. As the fan base/audience of the page reached 500 plus in 2 months, I then realized that I should make it more professional and interesting to its audience. I then started featuring artworks of artists I admire, restaurants I dine in, theatre plays I want to watch, performances of my friends in the Manila music scene etc. A few months after, I added Vic Sevilla, former editor of WOMAN TODAY magazine, as my co-administrator to the page to make it more professional. In September and October 2014, I added Ea Torrado of DALOY DANCE COMPANY and Noel Santos of THE WARRIOR POET CAFÉ as administrators as well. Daloy Dance Company is a rare mix of artists who use dance as a medium to reflect a deeper human language & raise the consciousness of its audience. How did you come about to include other aspects of lifestyle to the group page? The page is more of a lifestyle page since its creation though the art part has been a big part of it. Before, I even feature artworks of foreign artists but decided in early 2013 to concentrate on featuring Filipino artworks and artists. From 2013 to mid-2014, the page feature was balance as it featured a lot of restaurants, wine events, theatre play, concerts, artworks… Please check the albums in the page and you’ll see what I mean. Only when I created the AFKN group that most of my features became more of visual arts. Although, the idea of promoting Philippine Art and Filipino artists has been part of my objective for the page since the start, and what I want in the page (as for visual artists) is to have masters. Upcoming and beginners get equal mileage though when we feature them. Filipino Artist, Joel Masaya. Image via Facebook. Filipino Artist, Wilfredo Calderon. Image via Facebook. Filipino Artist, Rufo Bong Sunga Jr. Image via Facebook. Why did you choose to be an FB group or fan page instead of a blog or website? – I didn’t make a blog site since my standard in writing is very high and I wouldn’t pass even my own standards <laughs>. I love to read and talk, but write… nah… Being married before to a very good writer, a graduate of English Creative Writing from UP and having a bilingual poet as a daughter, my writing skills would be very elementary compared to theirs… <laughs>… Serious explanation though. – Website? Too complicated for me, besides, almost all big companies here and abroad have their own Facebook page/s even though they already have their company website. – Why Facebook? It’s free, easy to manage and almost everyone in the world uses it. With 2K+ members, how many of them are active on the page? How often do they appear on the wall? AFKN has 898 members now and there are about 70 members actively posting, liking member’s posts, commenting. Kimnetix Networx have 2,906 likes (without advertising it) as of this interview. As for Kimnetix Networx, we have a rule among admins to have at least an hour interval between each feature. As for AFKN, members post their works on the group every hour or so. Filipino Artist, Nunistell Mae Fulo- Lee. Image via Nunistell Mae Fulo- Lee. Filipino Artist, Joan Villa-Espina Soriano Honoridez. Image via Facebook. This page is for the advocacy to help promote your clients and artists. How is it working so far? Would you say it is an effective tool? I don’t have an advocacy for clients, only for artists and Philippine art as a whole. Like I’ve said earlier, my purpose or advocacy is to show the world how good the Filipino artistry is (in any field or family of art)…I want every artists be known if not worldwide, at least in the Philippines. Even myself, I didn’t know a lot of new artists until I made the page. My clients pay me to promote and market their establishments, the artists don’t. What about funding? How do you keep it up? How does the online magazine earn as an FB group page or fan page? I created the group not to make money out of it but to promote the things I am passionate about. It’s not like a blog site or website that you can make money from ads. I don’t have any sponsors or advertisers. If I do events for the artists of AFKN, that is the time I get sponsors but only when needed. For the charity/ charities that you help. What events do you stage and how frequent are they held? How do you collect sponsors? We don’t have any specific charity institution/s that we help in the group but we do help our members when in need and we do it collectively. As for the events that KN did in 2014, only the COLORS & HUES Group Art Exhibit of WALO VISUAL ARTISTS GROUP had a beneficiary which was Unilab Foundation’s PLAY IT FORWARD project and it was the art group who chose the beneficiary. How do we collect sponsors? I am a PR, Marketing and Sales person and been in different industries for years. Who and or what are your most notable personalities and works featured on your page? I would like to invite your readers to visit the page, check its wall and the albums there… Like I’ve said earlier, masters, upcoming or beginners are all equal in the page. Meaning, we don’t look at anybody as notable or popular. Just like me, I can sit down and talk with Raul Isidro or even Bencab the way I would sit down and talk with 14-year old art prodigy, Wanda Totanes. Only difference is that I would use the word “Sir” to the first two since they are senior artists. <laughs>. What are the upcoming projects of Kimnetix and AFKN? We are working on several concepts that we want to realize this 2015 like exhibits, workshops, art talks… We’ll let you know as soon as we prepared the STAGE. But the events that are set already are the KOMIKS LIVE ART SESSION as we already launched it last December at Dapo Restaurant & Bar which we will tour in different cities in the metro and KOMIKS ROCK SESSION Exhibit of Master Illustrator and Painter, Boy Capital. As well as our collaboration with Ea Torrado’s Daloy Dance Company, we just need a venue and sponsors for it but it will definitely happen this 2015. Have one portrait session with the one and only Filipino Master Artist Painter, Boy Capital. All images are courtesy of Kim Marcelo via Kimnetix Networx unless noted otherwise. Feel free to contact Kim Marcelo via Facebook or his email: kimnetixnetworx@gmail.com.